An Authentic Hidden Japanese Gem! I love what I do. Besides the food, it’s about meeting new people and they in turn become my friends. A good friend of mine that I know through blogging made a trip to the city recently. She called me up and said I am going to bring you to a yummy Japanese restaurant. No further encouragement needed my family and her family met up one Sunday for lunch at Taiko Japanese Cuisine located at Shoplex Mont Kiara. Now I have been to this restaurant before as it was previously called Ramen Taiko Japanese Cuisine. New owners have taken over the 48 pax restaurant recently in April 2014 and they have also engaged a new chef to lead this rebranded restaurant. Chef Steven Khoo last stint was at the famous Kirishima Japanese Restaurant in Cititel Hotel in Penang, a restaurant famed for their Japanese cuisine. Chef Steven had also previously worked with many acclaimed restaurant groups in Singapore and Bermuda. Taiko Japanese Cuisine has taken on a new life. Chef Steven is injecting his own touch to the menu with a big bang. He is a chef who believes in making everything from scratch, even down to his own recipe of soy sauce. A quick chat with him only confirmed that Taiko uses his homebrewed soy sauce, fresh wasabi, organic seasoning and no msg. He believes that only the freshest ingredients should be used and is proud to serve his own creations at Taiko Japanese Cuisine. In keeping with most of the dishes from the previous restaurant with few changes, Taiko’s menu now has a finer quality and also focus on serving up luscious cuts of Sashimi and Sushi among other dishes of Yakimono and Ramen. The restaurant décor remained the same from my previous visit with two sections allowing diners to host private parties or functions. There are quite a collection of Japanese books and newspaper to cater to those who love to read while dining. Taiko Japanese also has a lovely collection of Japanese Sake and beer available. The Sashimi Moriawase platter had thick luscious cuts of Salmon, Yellowtail, Seared Tuna, Surf Clam and Octopus with Wasabi. I wanted to literally hog this whole plate to myself. Look at the quality of the seafood. 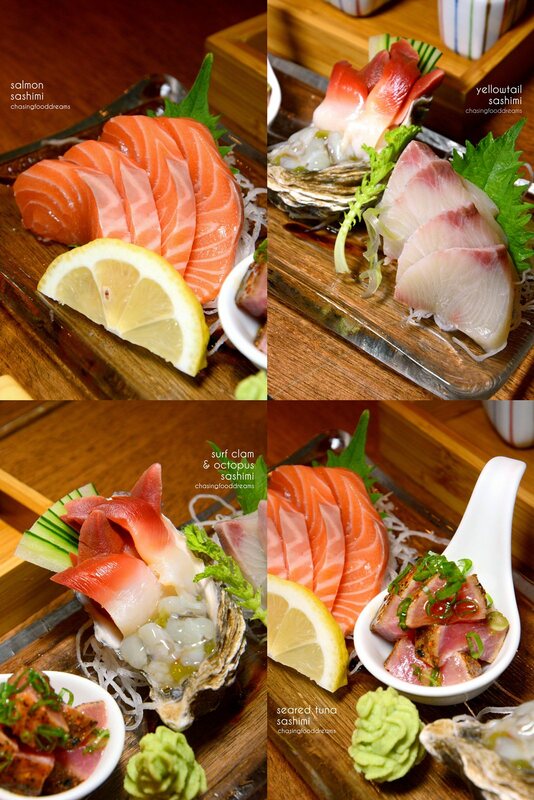 Glistening with freshness, the cuts of salmon and yellowtail are so divine in flavors. Delicate sweetness with firm texture that oozed with creaminess is such a welcoming note. Seared tuna spiced up and dressed with a light sweet soy sauce is very good in flavors. The oceanic flavor of the surf clams are also delicious while the hit of wasabi with fresh octopus tentacles paired like a dream with a tingling sensation. This plate of Sashimi is unbelievably awesome! 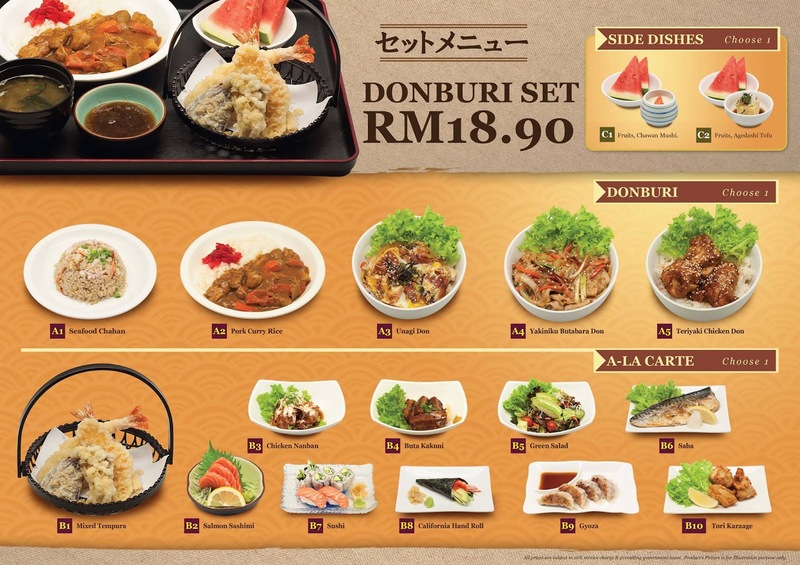 We also shared some house special rolls, a VIP Roll (RM12.90) and a Vegetarian Roll (RM9.90). The Vegetarian Roll has avocado, asparagus, carrot, cucumber and is wrapped with sweet beancurd, drizzled with mayo and sweet sauce and topped with fried leeks. I liked this roll as there are lots of textures going on with all the different vegetables. The sweet beancurd makes a lovely touch in flavor and texture too. It is a very yummy vegetarian dish. We moved on to Yakimono Specials. There are many choices and we opted for the following choices that are all nicely grilled and sauced up. Did I mention that Taiko Japanese Restaurant is non halal? Yep, in full glory are Ozura Bacon (RM6.90), Tomato Bacon (RM6.90), Otate Bacon (RM7.90), Chicken Thigh (RM5.90), Pork Belly (RM6.90) and Chicken Liver (RM4.90). 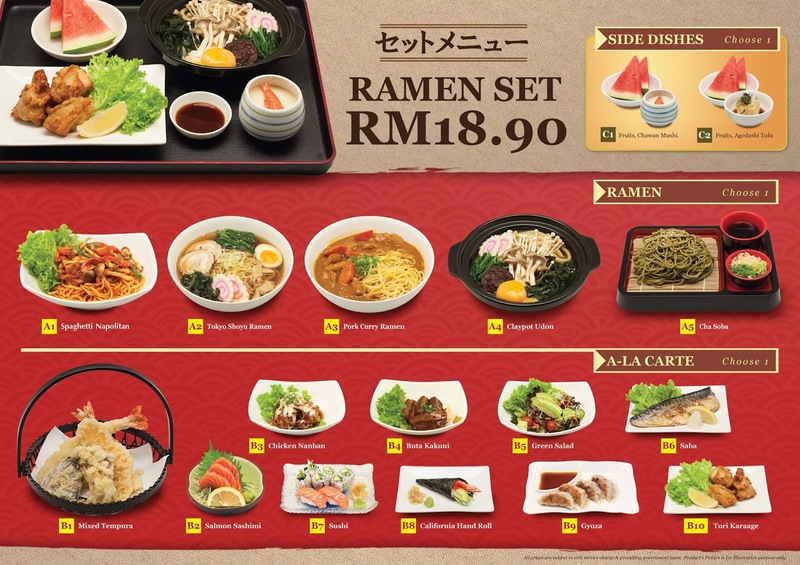 The Yakimono runs from RM4.90 t0 RM7.90 depending on the ingredient. Honestly, I can’t decide on a favorite so I'll settle for that anything has bacon to be my favorite! Love the popping juiciness of cherry tomatoes with the savory bacon, the creamy quail eggs with salty bacon and the juicy sweet scallops in bacon too. There is a side of sweet sauce to dip these in for extra flavors. Bacon makes everything so awesome… don’t you agree? The thick cuts of pork belly is nicely grilled and seasoned with layers of yummy fats and lean meat while the chicken thigh is paired with leeks as per traditional recipe. The chicken livers take some getting used to so one will either love it or not. The same sweet sauce is served on the side for dipping. I would have loved more chargrilled colors on these sticks. Ramen is up next and Chef Steven makes everything from scratch except the noodles. Our first one, Kumamoto Ramen (RM19.90) has ramen noodles with pork chashu, bamboo shoots, bean sprout, green vegetables, leeks, egg and sesame seed in a silky creamy white broth. One sip of the broth and you’ll know it’s been cooked with love for hours. Lots of bones and vegetables go into making the luscious broth that oozed with meaty essence. The savory broth even leaves a sticky sensation on the lips, making it lip-smacking good. The pork chashu is well braised with a delicious tenderness whie the egg is also prepared well as it has the essential molten egg yolk center. It’s a bowl of perfect comfort noodles that is worth slurping for! The second bowl was the Kimuchi Ramen (RM23.90). As you can see, its laden with loads of seafood and vegetables in a robust kimchi soup based broth. I like the broth as it is very full-bodied in flavors with a piquant tanginess. It’s hearty and spicy, kicking in my addiction for my love for spicy food. Chef Steven even makes his own ice creams. Such passion and effort deserves a pat on the back as it goes to show how much effort goes into Taiko Japanese Cuisine. Dessert is limited but after what we ate, we could barely fit anymore in our tummies. He makes these often and that day, we had Sea Salt Ice Cream, Lemon Peel Ice Cream and Green Tea Ice Cream. Truly unique flavors, it’s a hard choice and so we had all three. The Sea Salt takes some getting used too but I liked it. It’s quite a nice change to taste a salty ice cream instead of a sweet one. My favorite is the Lemon Peel, beautifully lemony and aromatic of citrus notes, it’s also creamy and so fresh tasting. I can taste the bits of lemon peel in this too. The Green Tea is served with red bean paste. It’s more delicate than those on sale and has an earthy soft green tea taste. All three ice creams are RM6 a scoop. I love the new Taiko Japanese Cuisine. Dishes here taste authentic and comforting. It’s a place where you definitely want to hang out for a meal comfortably. Taiko also has lunch deals that are worth checking out if you are ever in that area. I also found out that Chef Steven also offers Omakase sets with which needs to be pre-ordered in advance. I’ll be back for more…especially that Sashimi Moriawase! The salmon sashimi looks perfect! thickly sliced with promising orange hue, the Ramen seems equally good too! I have never been a fan of seafood but the pictures are making me want to try some real soon. Your description has done justice to the beautiful pictures, great job. I think I shall try Salmon, let's see if the taste buds approve.